Has the Trump administration removed the Syrian wing of al-Qaeda from American terrorism lists? You could be forgiven for thinking so, after the Canadian Broadcasting Corporation (CBC) revealed in a May 14 article that the United States does not consider the Islamist group Tahrir al-Sham to be a terrorist faction—but that’s a misunderstanding. The United States remains committed to fighting jihadi influence in Syria, considers itself legally entitled to target Tahrir al-Sham members with airstrikes, and will continue to assassinate its leaders. But the U.S. State Department’s formal classification of the group is fuzzy and confusing, partly as a result of years of Islamist shell games, which has led many to think the United States is changing its stance. Even some prominent Tahrir al-Sham leaders have cheered the CBC article. The fact remains that the United States is still treating Tahrir al-Sham as a terrorist group. To unpack this mess of misinformation, let’s take a look at the history of the al-Qaeda wing in Syria. The United States first designated a Syrian rebel group known as the Nusra Front as a Foreign Terrorist Organization or FTO, which brings with it a raft of sanctions, in December 2012. At the time, the Nusra Front presented itself as an independent Islamist group, but U.S. intelligence had correctly identified it as a front for the al-Qaeda-linked Islamic State in Iraq, and it was designated as such. This also meant that its members could be targeted under an Authorization for Use of Military Force (AUMF) issued by the U.S. Congress on September 18, 2001, in response to al-Qaeda’s attacks on New York and the Pentagon. Then, in 2013 and 2014, the jihadi movement broke apart. Syria was at the heart of a global split between al-Qaeda’s central leadership and its increasingly ambitious Iraqi offshoot, the Islamic State. The Nusra Front was torn apart in that split, but the surviving faction pledged its loyalty to al-Qaeda’s top leader Ayman al-Zawahiri, believed to be in hiding in Pakistan. From a U.S. government perspective, it made no difference: whether they loved or hated each other, both the Islamic State and the Nusra Front would keep their FTO designations and could be attacked under the AUMF. Unlike the Islamic State, which declared itself in 2014 and tried to crush all rivals, the Nusra Front has sought to embed itself within the wider Syrian opposition and slowly radicalize it from within. But it was a strategy that would require painful concessions, testing the cohesion of a group that has struggled to define its ideology since the Islamic State split. Some Nusra Front members wanted to dial down the jihadi radicalism further in order to attract the soft-Islamist rebel mainstream, but others worried that too many compromises risked diluting al-Qaeda’s religious doctrine. Some founding members, including the Iraqi Maysara al-Jebbouri (alias Abu Maria al-Qahtani) and a Syrian known as Saleh al-Hamawi (Abu Mohammed), sought support from the other big jihadi-influenced faction in Syria, Ahrar al-Sham. Although the latter group had some links to al-Qaeda-inspired militancy, it had renounced all ambitions outside Syria and was willing to work with a broader spectrum of allies; in particular, its more pragmatic members actively courted support from Turkey and Qatar. These foreign dalliances were anathema to some of the more hawkish Nusra Front officials, who were horrified by the idea of working with American-allied governments. In particular, a trio of Jordanians raised the flag of absolute fealty to the al-Qaeda brand: Sami al-Oreidi (Abu Mahmoud al-Shami), Bilal Khreissat (Abu Khadija al-Urduni), and Iyad al-Toubasi (Abu Julaybib al-Urduni). The Nusra Front’s top leader, Ahmed al-Sharaa, better known as Abu Mohammed al-Golani, balanced unhappily between these two camps. For a time in 2014, the hardliners advanced and launched a ruthless purge of American- and Saudi-backed rebel factions in northern Syria. Jebbouri lost his job as the Nusra Front’s religious chief to Oreidi in summer of 2014, while Saleh al-Hamawi was expelled in July 2015. To stand up to Syrian President Bashar al-Assad and his Russian and Iranian allies, the rebels urgently needed to close ranks—and they also needed to stop alienating other Islamists. But the tide turned, as Golani and his fellow jihadis began to realize that they were losing the war. To stand up to Syrian President Bashar al-Assad and his Russian and Iranian allies, the rebels urgently needed to close ranks—and they also needed to stop alienating other Islamists. Syria’s less ideological rebels were drifting into the orbit of pro-Western regional states like Turkey, Jordan, or Saudi Arabia, and that was bad news for the Nusra Front. In particular, the Nusra leaders wanted to pull Ahrar al-Sham into a union, sensing a chance to decisively shift the insurgency’s center of gravity toward their own position. This was the point at which their connection to al-Qaeda began to pose a real problem. Though some Ahrar al-Sham leaders were perfectly at ease with global jihadism, others were horrified at the prospect of merging into a terrorist-designated al-Qaeda franchise, which would have scared off their international backers. As a result, both groups began to suffer from interlocking internal conflicts. Pragmatic members of Ahrar al-Sham kept moving closer to Turkey and Saudi- and Western-backed Free Syrian Army factions, but faced resistance from Ahrar al-Sham’s hardline wing. For their part, the jihadi-friendly Ahrar al-Sham members found common ground with Nusra Front pragmatists, who felt ready to dial down their support for al-Qaeda if that facilitated a merger with Ahrar al-Sham. But the Nusra doves, in turn, faced resistance from that group’s hawks, who insisted on waging global jihad on behalf of Ayman al-Zawahiri and warned against a slippery slope of concessions. In July 2016, the Nusra Front’s internal debates broke in favor of the pragmatists, with Golani apparently having decided that the benefits of a merger with Ahrar al-Sham outweighed any risk of doctrinal corruption. The Nusra Front restyled itself the Fateh al-Sham Front and announced an amicable separation with al-Qaeda. Though the rebranding didn’t fully filter down to the rank and file, it was enough trigger a small but high-profile revolt within the Nusra/Fateh leadership. Khreissat, Toubasi, and a few others jihadi hawks decided to leave rather than break their oath of loyalty to Ayman al-Zawahiri. The transformation into Fateh al-Sham was more a play for the hearts and minds of Ahrar al-Sham and other Syrian Islamists than it was a bid for Western approval, and the United States was predictably unimpressed. “Whether it calls itself Jabhat Fath al Sham or al-Nusrah Front, the group remains al-Qa’ida’s affiliate in Syria,” a State Department spokesperson said in November 2016, explaining that the new name had been added as an alias in the Nusra Front’s FTO designation. Indeed, the United States ramped up pressure on the jihadis in northwestern Syria in autumn of 2016, killing dozens of Fateh al-Sham members and leaders in a string of lethal drone strikes. Golani’s talks with Ahrar al-Sham continued, but even though all involved claimed to favor unity, the Turkey-backed wing of Ahrar al-Sham was unwilling to go through with a merger and kept coming up with new excuses to back out. Their rivals among the Ahrar al-Sham hardliners became increasingly exasperated. Led by Hashem al-Sheikh (Abu Jaber al-Maskani), they threatened to split from the group and join Fateh al-Sham on their own. Meanwhile, in Fateh al-Sham, Golani stood accused of having conceded al-Qaeda’s place in Syria without getting anything in return. The situation unraveled in January 2017, when Turkey struck a deal with Russia to convene peace talks in the Kazakh capital of Astana. Fateh al-Sham correctly perceived the talks as a threat, and responded with a swift and brutal strike against the Turkish- and American-backed factions that had sent representatives to Kazakhstan. At that point, Ahrar al-Sham rose to protect its rebel allies. The Islamist infighting ended in a cascade of rebel splits and mergers, in which Ahrar al-Sham picked up what was left of the Free Syrian Army groups broken up by Fateh al-Sham, while Fateh al-Sham absorbed Hashem al-Sheikh’s hardline faction of Ahrar al-Sham and a few other local groups. Illustrating the fluidity of Syrian rebel politics, the largest of the new Fateh al-Sham allies, known as the Noureddine al-Zinky Brigades, had until mid-2015 been supported as an anti-jihadi counterweight by the United States. Ahrar al-Sham would keep its old name and leadership, but things played out differently on the jihadi side. Fateh al-Sham and its allies merged into a new organization called Tahrir al-Sham. 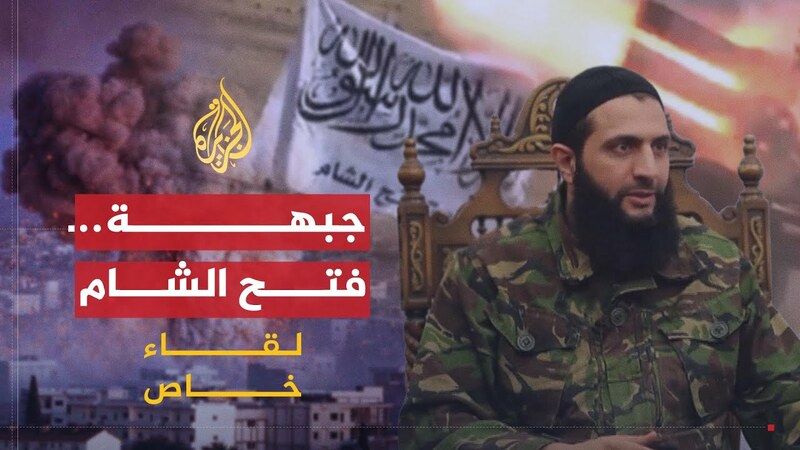 Sheikh would be the leader and Golani took on a less impressive title, but the old Nusra Front founder was widely understood to remain the most powerful figure in Tahrir al-Sham. To some jihadi radicals, the creation of Tahrir al-Sham was further evidence of Golani’s descent into unprincipled opportunism. Sami al-Oreidi now defected to join Khreissat, Toubasi, and their hawkish allies, most of whom had insisted on continued fealty to al-Qaeda. In this, they were backed by the influential Amman-based jihadi thinker Essam al-Barqawi (Abu Mohammed al-Maqdesi), who accused Tahrir al-Sham’s leaders of going soft and of having betrayed Zawahiri. The pro-Qaeda hardliners now appear to lack a proper organization in Syria, but they have kept needling Tahrir al-Sham from the sidelines. In late April, Zawahiri weighed in with a broadside against “localizing” the conflict. His supporters in Syria seemed to feel vindicated and they now ramped up their criticism of Golani’s men. “You are still trying to present yourselves to the international community as the representatives of Syria’s armed opposition, and you have tried every method to market yourselves for this task,” Khreissat thundered in an open letter circulated by online supporters on May 15. “You have made every conceivable concession, and today you stand on the last remaing strip of truth that separates unbelief from faith.” In another public statement, Sami al-Oreidi pointed to the United States’ 10 million dollar bounty on Golani as evidence that breaking with al-Qaeda had not earned the jihadis any goodwill. “You cannot make America or global Zio-Crusaderism feel pleased with a Mujahid,” he scoffed. Or can you? As noted by CBC, the American FTO designation has in fact not been carried over from Fateh al-Sham to Tahrir al-Sham. The fact that Golani’s new group isn’t formally designated as an FTO came as a surprise to many Syrians and Syria-watchers, and some understood it to mean that the United States is taking Tahrir al-Sham off its blacklist. One of Tahrir al-Sham’s top clerics even cheered the American decision to delist his group, in the hope that other Syrian Islamists will now be less fearful of joining it. “Tahrir al-Sham was never listed, so it cannot be delisted,” one U.S. official tells me. But of course, there is no such American decision. “Tahrir al-Sham was never listed, so it cannot be delisted,” one U.S. official tells me. That doesn’t mean that Tahrir al-Sham won’t be listed in the future, or that the group isn’t already treated as a terrorist faction. For one thing, the United States insists that Tahrir al-Sham contains terrorists. State Department spokesperson Edgar Vasquez tells me the very much FTO-designated Nusra Front forms “the core” of Tahrir al-Sham, though he is vague on the FTO status of other members, like Sheikh’s Ahrar al-Sham defectors or former members of the Noureddine al-Zinky Brigade. Other U.S. officials, however, say the only deliberation still going on within the government over the status of Tahrir al-Sham is whether to designate the group as a mere alias of the Nusra Front or as a new terrorist entity. According to these officials, the State Department views all members of Tahrir al-Sham as al-Qaeda proxies tainted by association with the FTO-designated and AUMF-targeted Nusra Front—and they should expect no quarter from the United States. That should be clear enough. Tahrir al-Sham may not be formally FTO-designated just yet, not under that name, but there’s no doubting the U.S. government’s hostility to it. Rumors and conspiracy theories are now spreading among the warring parties in Syria about how Trump has softened his stance against Syria’s former al-Qaeda branch, but they stem more from the State Department’s failure to clearly explain the U.S. position than from any actual change in policy—and joining Tahrir al-Sham can still bring American bombs raining down on you. Thanks to TCF fellow Sam Heller for valuable input. Cover Photo: Video screenshot of Abu Mohammed al-Golani, 2016. Source: Al Jazeera.